Update: Open House notes available here. 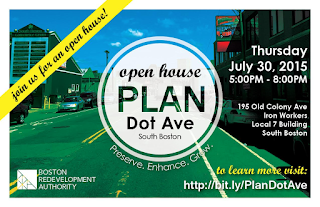 The BRA is launching a process to create a new vision and plan for the Dorchester Avenue corridor area in South Boston. Residents, property owners, business owners, community and civic groups are invited to this open house event to learn more about the study, the area, and how to get involved. In South Boston, the Dorchester Avenue corridor from Andrew Square to Broadway Station is undergoing a shift away from traditional manufacturing and industrial uses, as demand for residential and mixed-use development increases. Situated between two major Red Line stations and bus hubs, the corridor is ripe for transit-oriented development. The goal of the South Boston study will be to create new zoning that aligns the aspirations of the community with predictable development conditions. Dorchester Avenue’s underutilized light industrial buildings will be the primary focus. The BRA will look to residents for ideas on how such properties could be transformed to contribute more positively to the corridor in the future. The study will suggest strategies for improving access to retail and developing affordable housing to meet the needs of local families, in addition to public realm improvements, traffic mitigation, and other economic development opportunities. The Dorchester Avenue study area encompasses a portion of South Boston’s largest residential zoning district. The so-called H-1-50 zone, which touches Andrew Square, will be analyzed in hopes of updating antiquated zoning to allow for reasonable increases in density that would accommodate population growth. Based on resounding feedback from neighborhood residents and South Boston’s elected officials, Mayor Walsh has asked the BRA to work with the community so that any new zoning recommendations maintain the character of this residential district and place a renewed emphasis on architectural continuity.